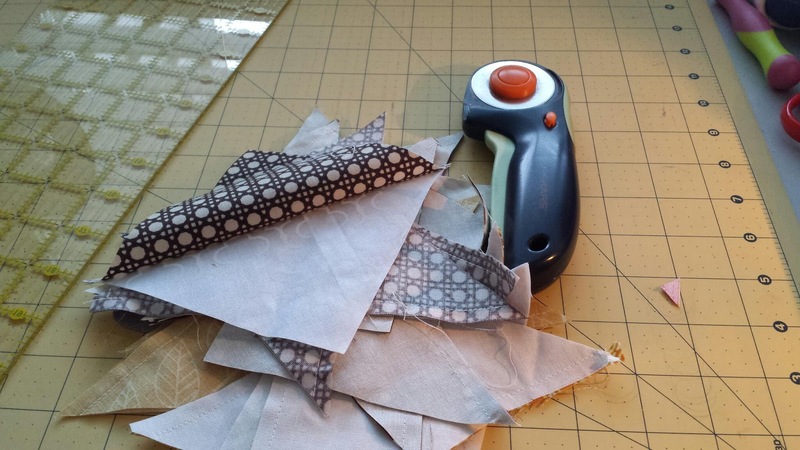 Quilty Habit: WIP Wednesday - Help! ...still shirking most sewing responsibilities for this selfish quilt top. Don't judge too harshly. Is there therapy for Modern Maple making? The only thing that starts to get me down is all the HST-making. I consider myself all but a pro now, thanks to the Sisters' Ten BOM, but still - it's a lot of work! I clearly still have to make a whole bunch more blocks to get to a large lap size (I like my couch quilts to cover both the hubs and I on the couch, and also our toes - I'm 5'10" and he's 5'11"). What do you think about adding in three or four blocks with a saturated background (purple, red, etc. ), with the leaves low-volume? I've been playing around with the idea and I need input, please! Back to our regularly scheduled programming soon. I've been doing less blog reading and more sewing and working. Whoops :) However, I am wishing I was at Sewing Summit. Total bummer... I hope to go one day. Hope everyone has fun! Linking up at Freshly Pieced. Fall is coming in your quilting studio! Love your leaf blocks. The alternate block sounds fun! It would make the quilt unique and I love those. I just finished up making a table runner using the same maple leaf block. So it was really fun to see how you put a whole different spin on the same block. They look awesome! I think an alternate block would look great! I can't wait to see what you end up doing! It's looking good! Bear claw/paw blocks are similar, and fun to make too! I think maybe just one inverted-color block would be a good focal point! I like the idea of the low volume leaf, I bet that would look awesome. I would maybe just add three mixed in randomly. I can get away with using a baby quilt I never gave away to cuddle under since I am only 5', sometimes not being tall has its advantages, haha. Though, a baby quilt would not be good for two. I wish I was at sewing summit too :( I love your modern maples though. I think the saturated backgrounds with the low volume leaves would be cool! Looking good! I like the idea of LV leaves with darker backgrounds. Love the low volume idea... try one or several! I have fabrics pulled to make one but haven't cut into it yet because I know I won't be able to put it aside either. Keep going!! I wish I could add an opinion but I am no good a visualising what might be! That sounds like a fabulous idea! Your Maples are looking good, Jessica! And, yes, HST's are a pain, but sew worth the time and effort!